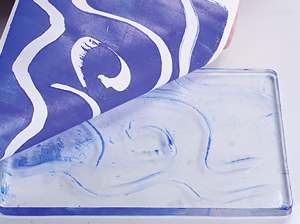 Gel Printing Plates look & feel like gelatin, but are durable, reusable & store at room temperature. They’re easy to clean and always ready for printing. 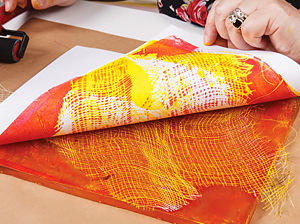 Monoprinting on a Gel Plate is simple and fun. 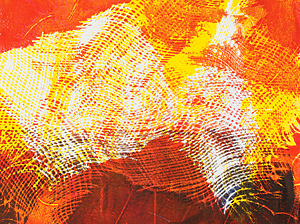 While it’s best to use acrylic paints and fabric paints, many paints and water soluble printing inks are safe to use with the Gel Printing Plate. Dyes are not recommended as they may stain your plate. It is not necessary to clean your plate between prints, but after you have finished use a mild soap and water to remove any paint residue. Store your plate in between the plastic film it was packaged in and return it to the clamshell package for storage. 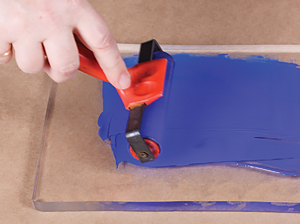 Keep in mind your Gel Printing Plate’s surface is very sensitive so make sure not to sit it on a rough surface or push too firmly into the plate. 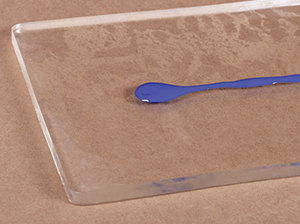 It is best to place the plate on a non-porous barrier such as a Teflon® sheet, baking tray or piece of glass while you are printing. Also choose soft tipped tools to make your marks into your rolled out paint. Make sure to read the pamphlet included with the product for the manufacturers full recommendations. Apply acrylic paint to the plate. 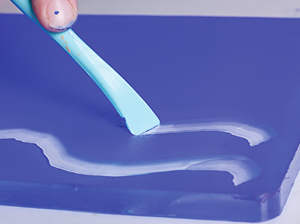 Use a hard roller to evenly cover the plate with paint. Use soft tipped tools, e.g. 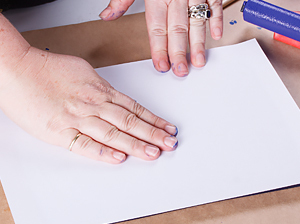 cotton buds, paint brushes or soft rubber tipped tools/stamps, to make marks in the paint. Create a design you're happy with. Press your paper firmly down on top of the plate. 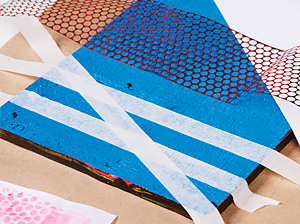 Peel back paper to reveal your monoprint. It is not necessary to clean the plate between prints! 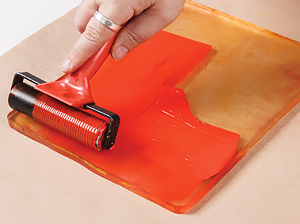 Apply acrylic paint using a hard roller. 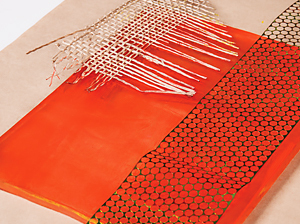 Place objects such as plastic grids, bubble wrap, string or leaves onto the plate to make marks. Or leave them there to create a stencil by blocking out areas. 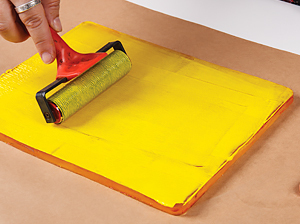 You may use a clean hard roller for more pressure on the back of your paper when pulling your print. 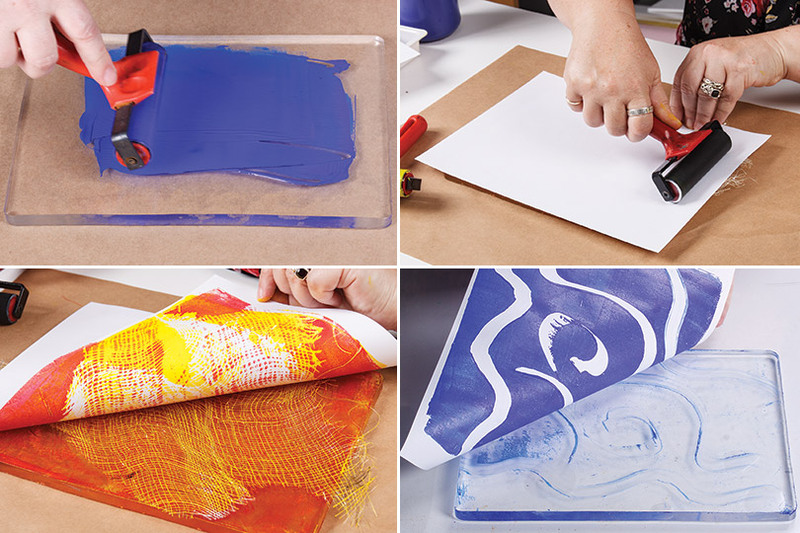 Peel back paper to reveal your monoprint. Allow your print to dry. Apply a second colour of paint to the plate. 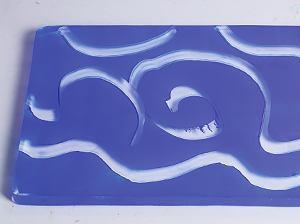 Lay down more stencils or make more marks with soft tools. Align previous print and lay it down on plate applying pressure. 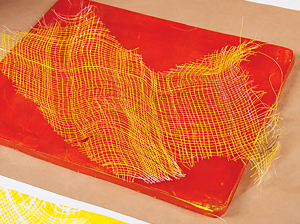 Reveal the second layer of your print. Repeat steps until you are happy with your print. This can be a stand-alone piece or may be used as collage paper! 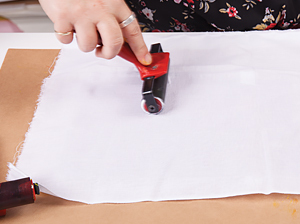 Apply Permaset Aqua Fabric Ink using a hard roller. 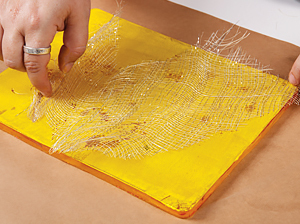 Lay a piece of fabric over the top of your plate and smooth it down using a clean hard roller for more pressure. 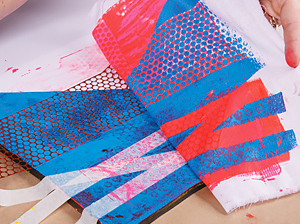 Peel back fabric to reveal your monoprint. Allow your print to dry. Apply another colour of paint to the plate. 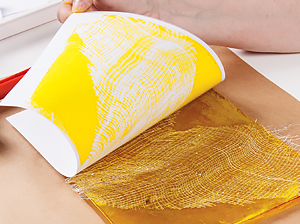 Lay down more stencils (such as masing tape) or make more marks with soft tools. Align previous print and lay it down on plate applying pressure. 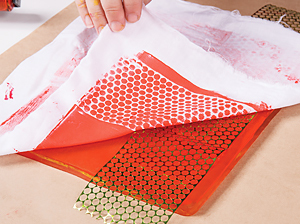 Peel off the fabric to reveal your print! If you are feeling inspired and want to explore our Gel Plate Range you can buy it now.